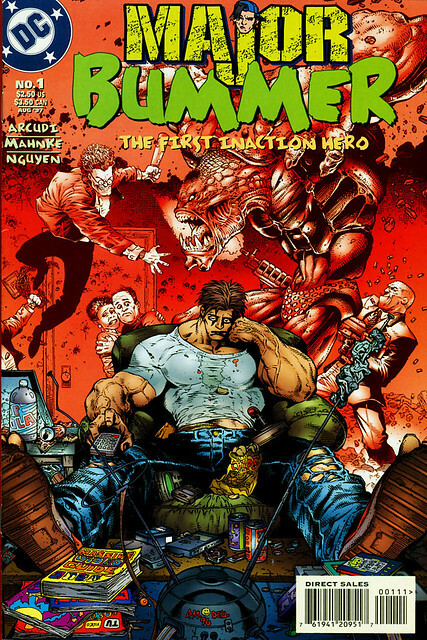 A good way to spend this April Fools Day is to revisit a 1997 DC Comics series called Major Bummer. Written by John Arcudi and drawn by Doug Mahnke, it lasted 15 issues, but I’ve kept them in my collection and refused to let them go. 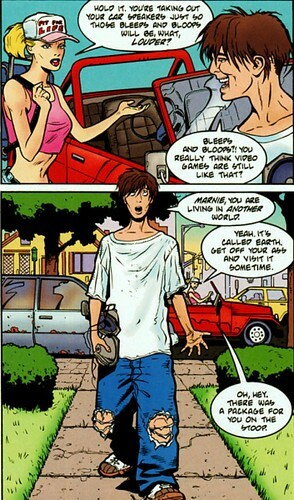 Major Bummer is probably the most realistic—and hysterical—take on superhero comics that I’ve ever read. Major Bummer features Lou Martin as the titular star. 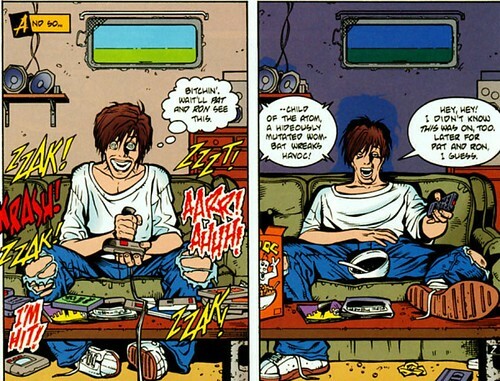 Lou is a skinny slacker-nerd to the max, devoted to gaming and all things geek. His neighbor thinks Lou’s out of touch with reality, and she is correct. He works in a VCR repair shop, lives in a crappy apartment and spends his nights console gaming and drinking beer. I find this panel above a little too close to my own reality. I did better than Lou in terms of my job and my life, but at the core essence, on certain nights, this is me. Lou wakes up the next morning after a long gaming session to find his body transformed into 8 foot 500 pound juggernaut. 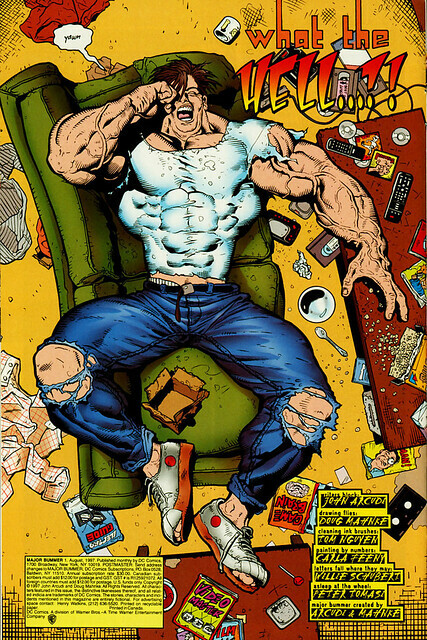 It takes him a while to realize he’s become a Hulk—Lou’s more worried about being late for his job at the VCR repair shop. Even after he realizes what he’s become, becoming a superhero is the furthest thing from Lou’s mind. He’s thinking about his next meal or repairing his beat up car. Lou's brain is also super-intelligent, but that can only be accessed by his sub-conscious. Lou builds an EMP ray gun at the VCR shop while he's daydreaming while nursing a hangover. There is a zany cast of characters that immediately swarms around Lou. In addition to near invulnerability and super strength, Lou has become a magnet for other super-powered beings, including Fly Girl, the Gecko, Sonic, and a psychic who can see the future—but always seems to announce the events too late to be any help. Their powers are a result of an experiment two alien youths are doing for a school project. It turns out that Lou wasn’t even the intended target for the prime superhero powers. A man named Martin Lewis was the original guy, but the aliens read the name backward. I’ve re-read the first four issues of the series and I’m laughing like crazy. One thing that really seems hilarious is just the basic design of Valerie Fly-Girl’s costume. Most super-heroine outfits have a classic bustier that supports the cleavage and props it up. Doug Mahnke inverted (or subverted?) this principle as you can see here. Fly-Girl’s mid-section is exposed and there’s just no way in hell that her cleavage wouldn’t fall out of that as soon as she started flying in the air. There’s also a Dumb and Dumber element to the story. Valerie is obviously crushing on Lou—even gets him a job at her Dad’s Ice Cream parlor—but he’s too blind to see it. I just did a quick Google search to see if there was a Major Bummer collection. I found this video interview with John Arcudi from the Emerald City Comicon last month. Dark Horse is going to be collecting all 15 issues, which is fantastic news. I highly recommend the whole series. Nuff Said!